In 1940, after Russia invaded Poland, Stalin deported 1.7 million Poles to slave labour camps in Siberia and Kazakhstan. Only one third of them survived. 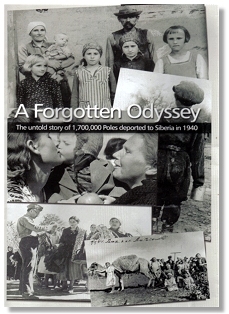 A Forgotten Odyssey - The Untold Story of 1,700,000 Poles Deported to Siberia in 1940 tells their story. By 1941 when the Nazis attacked the Soviet Union perhaps half of the labour camp inmates had already died from disease, starvation and the terrible conditions. This film deals mainly with those lucky enough to escape from Russia in 1942 and who went on to continue the fight in General Anders army. In their own words the survivors tell their moving story. The film was available in VHS and DVD format. After the death of the film producer Aneta Naszynska in June 2010 information on future distribution of the film is awaited. Further information about the deportation of Poles to Russia from eastern Poland (Kresy) can be found at Kresy-Siberia Foundation (Facebook). The Kresy-Siberia Foundation is dedicated to researching, remembering and recognising the Polish citizens deported, enslaved and killed by the Soviet Union during World War Two. The director Jagna Wright died on 16 June 2007 and Aneta Naszynska died on 4 June 2010. Passionate, exuberant and full of life, Aneta’s death was unexpected, sudden and swift. She was barely 52...she was stranded in the west when “Solidarity” was suppressed and Martial Law declared in Poland on December 13th that year. She then made her life in London...By commitment and passion she was a filmmaker: everything from funny and tender home movies cut for friends and beautiful records of her countless travels, to a very serious and significant documentation of Polish history. In 1992 she bought a camera, taught herself the craft and started recording the testimonies of the dwindling witnesses to the Siberian genocide. Around 20% of those deported were Jewish; of the 1.7 million total, it is estimated that around 400,000 survived. Jagna teamed up with a fellow Pole, Aneta Naszynska, a professional editor, and working for two years in their spare time with no financial or professional backers, they produced a harrowing documentary. Jagna Wright..tried for five years to persuade broadcasters to make a television film about the 1,700,000 Poles deported to the depths of Russia in 1940, then bought a secondhand digital camera and made it herself...with the witnesses dying off, Jagna Wright started to interview some 40 survivors...They recounted the Poles' month-long journey in cattle trucks to Eastern Russia and Kazakhstan; the Russian assurances that bourgeois Poland was finished, and that they would never leave the forests where they had arrived to work with little food or shelter...It has been shown on television in some 14 countries. Jagna Wright (1950-2007) memorial document (pdf file). The Polish Embassy in London reports that the Polish History Museum in Warsaw has been given several hundred hours of original film material. This includes interviews with Polish survivors of the Soviet deportations to Siberia which were included in the film A Forgotten Odyssey. This page was added on 13 April 2008. Updated on 06 November 2018.